Used towards the later part of his career. For the most part, he had two 50 watt bass heads with three Y-Cables so he could use both of the HI-inputs of both the channels of both his Marshalls. The heads were played through two half-open back cabinets fitted with JBL D-120F speakers, although on occasions he would also play through a (Cerwin) Vega P.A. system [Richard Albero, Guitar Player magazine, May/June 1973] (please note that Cerwin-Vega company was renamed a couple of times. In 1972, after Duane’s passing, it became Cerwin-Vega. From 1967 to 1972 it was called Vega Laboratories, Inc.). 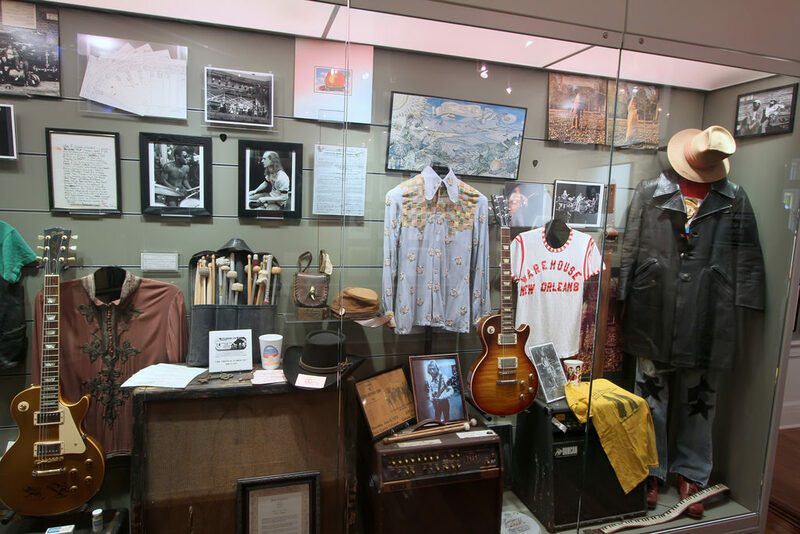 Allman Brothers Band initially bought four Marshall cabinets and sixteen JBL speakers in early 1969 [Willie Perkins: Memorabilia, p. 5], which suggests that Duane and Dickey both used two Marshall cabinets with four JBL speakers per cabinet. One of the slanted cabinets was pictured from behind, clearly showing four grey basket JBL D120F speakers (note that orange basket JBL D120F were manufactured by JBL for Fender). The cabinet which Duane had right below one of his Marshall amps was a model 1935 with “Bass” logo in the lefthand top corner on the grey basketweave grill cloth (aka Salt and Pepper grill cloth). However, according to Don Butler [Randy Poe: Skydog, pp. 297 – 298] Duane’s cabinets were loaded with a combination of Celestion speakers and Cerwin-Vega ER-123 speakers. Please note that Kim Payne, who was in charge of ABB’s amp line and should know, was not interviewed about this [Randy Poe, Skydog, p. 285]. The theory that he used Cerwin-Vega ER-123 speakers could have originated from him playing through the Cerwin-Vega P.A. system, which as previously noted, Duane did sometimes. The Celestion speakers could have been the ones the Marshall “Bass” cabinets, models 1935 and 1935B were originally loaded with – G12M T 1511 or G12H T 1281 (in both cases in combination with the low resonance, 55 Hz, type 102 – 014, cone, made by Pulsonic). Don Butler’s statement can also be explained, perhaps even better, by the fact that Duane used a few different rigs in 1971. He was seen using Marshall cabinets, with either one slanted and one straight, both straight, or one slanted sitting on one or two road cases. But what’s more important – he was also seen using a Sunn 412 cabinet together with the slanted cab, on October 2, 1971 at the Whisky in LA. Although it is not clear from the photos, this could’ve been (and most likely was) a Sunn 412V cabinet (with ‘V’ referring to Vega), which was shipped with ER-123 speakers. From this, we can conclude that Duane did in fact at least experiment with Cerwin-Vega ER-123 speakers. Furthermore, it is also possible that after using Marshall and Sunn cabinets together, he mixed the speakers from the two cabs in order to save one microphone channel. If you replace two of the speakers from the slanted Marshall cab with two from the Sunn cab and put the two speakers from the Marshall slanted cabinet into the Sunn cabinet then you can save one microphone channel. Otherwise, you must mike both cabinets to capture the different sounds (thanks Ingemar for research). One of the Marshall Bass amps used by Duane is now owned and used by Derek Trucks. Pictures clearly show that the amp was serviced and modded by “Dennis Electronics”, a New Jersey-based company owned by Dennis Kager and that the amp is a pre-mid 1969 model since it has the 1202-118 lay down mains transformer manufactured by Drake. It is not known when exactly the modding took place, but it was most likely done after Duane’s death, since according to Richard Albero [“Just Rock On, And Have You A Good Time” – Guitar Player magazine, May / June 1973] Duane never modified his gear. However, given the high EL34 failure rate on the Marshall amps, it is likely that Duane had different vacuum tubes in his Model 1986s at some point. Although replacement EL34 were readily available at the time, people who fed up with the high failure rate often opted to use tube from other manufacturers. This leads as to a quote from Don Butler, who goes by the nickname “TM1” on the Les Paul forums. Don confirms that Duane did indeed use 6CA7s, but as another member points out a couple of posts below, these tubes didn’t exist until around 1970, so Duane used them for a relatively short period of time. If you’re unfamiliar with these names, Don Butler was a friend of the band, who met Gregg and Duane in 1968 in LA. In 1972 he started his job at Cerwin-Vega, and today he does repairs and modifications on old tube amplifiers, guitars, and effects pedals (see his website tone-man.com). Joseph “Reddog” Campbell and Joe Dan Petty, on the other hand, were roadies.